When you enter a phone number in contacts, you can choose an alternate keyboard and click the “pause” button, but when you’re on the dialing keypad, there is no such button. If you hold down * a comma will appear. This is a pause, which tells the phone to wait before dialing the numbers that follow. This allows you to enter your voice mail password or other automated phone system entry before the call. I discovered this one last night and I haven’t seen it documented anywhere else. This is extremely useful if you want to write a post on your blog about iPhone secrets and you need screen captures. It’s also great if you want to make wallpaper based on a written note or a anything you display on your phone. 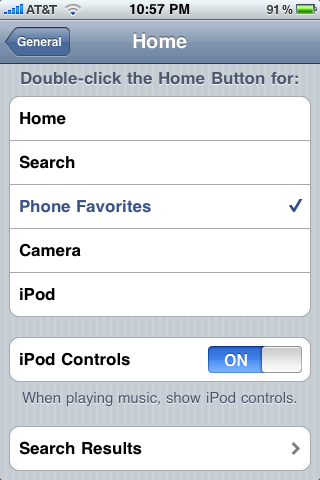 Basically, hold down the home (front) button and then press the standby (top) button. You’ll know it worked because the screen will flash white. The image will be added to your camera roll. Your iPhone is a small computer and like a computer, it sometimes requires a restart when it’s behaving poorly. Occasionally it freezes or it can’t find the network after resuming from airplane mode, remedy this by holding the home and standby buttons for about 10 seconds, until you see a slider to shutdown or an apple icon appears on the screen. Double-tap a word to select it for cut/copy/delete. Quadruple-tap a word to select the entire paragraph for cut/copy/delete. At the end of a sentence, double tap the space bar to get a period and a space. Apple stole this one from Blackberry and I’m glad they did. When typing on the iPhone’s qwerty keyboard, you obviously need to press the “. ?123” button to get the punctuation keyboard. After you type a punctuation mark, you have to press the “ABC” button to get the qwerty keyboard back. But, if you press the “. ?123” button and keep your finger down while you slide over to your punctuation mark, and then lift up on that mark, it will add that punctuation mark and switch back to the qwerty keyboard, saving you a couple taps in the process. When you want to navigate to a new web page, refresh the current one or perform a new search, you have to get back to the top of the page. The fastest way to do that is tap the title bar, it’ll take you up. If you liked the space bar secret, you’ll love this. Double tap a block of text in Safari to zoom in on that column and fit it to the screen. This makes it much easier to read text in web pages. Some web pages have scrollable objects embedded in them, such as large text fields. If you want to scroll that item without scrolling the whole page, use two fingers on that item to scroll it. Thanks to Ryan Harper for suggesting some of the tips. Entry filed under: Be Efficient, Computers and Internet, Gadgets and Toys. Tags: apple, button, code, iphone, ipod, secret, tip, touch, trick. Woah, awesome!!!! I didn’t know that comma trick either. just discovered that double clicking the UP arrow will create a CAPS LOCK. Great trick! just discovered that double clicking the UP arrow while typing a message will create a CAPS LOCK. Great trick! I’d hug you, but that’d be kinda gay. Very nice, trying them out right now! Thanks! Vertical scrolling can be achieved by keeping your finger on the absolute right hand side of the screen and scroll down a bit. Then vertical scrolling is initiated, and if your finger slides to the left, the scrolling will still be vertical. Great list this one. I’ve compiled a pretty good list myself recently with many for other phones too. Sam, it is all old stuff when you chime in a year later! The double tapping the UP arrow didn’t work for me but I did find that if you keep your finger on it, it is basically caps lock/shift. how do i reset the camera? mine froze up wont let me take pics or videos..
you just hold down the home and lock button untill the ipod/iphone/ipad restarts. then you must UPDATE yoself . Yeah . Those tricks are cool . that helped me quite a bit. thank you!